Have you ever wondered what will happen this year in the web development industry? At the beginning of each new year, we like to make questions and predictions that at the end may or may not happen. Today in this article by one of our readers, we’ll do the same thing and take a look at 7 web development predictions for 2019. After reading it, let me know what you think about these predictions. Do you think he is right? Let’s begin! Many technologies come and go in the web development space. Some of them make a lot of impacts, while many others disappear. People were making a prediction like “Web Development will end due to WordPress” after the increased popularity of WordPress and other web building tools. 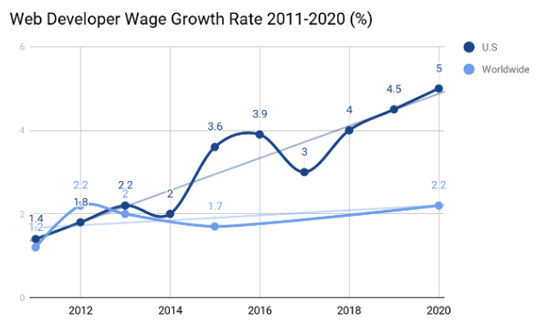 However, the demand and wages’ growth for web developers are still there. 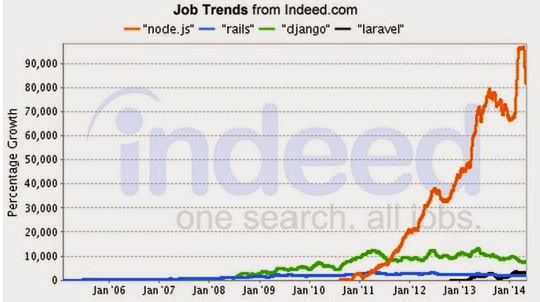 You can see that despite the growth of the use of web building tools, there is still a growth in the wage of web developers. Keep in mind that the world will always need web developers, regardless of the growth of the popularity of web building tools. 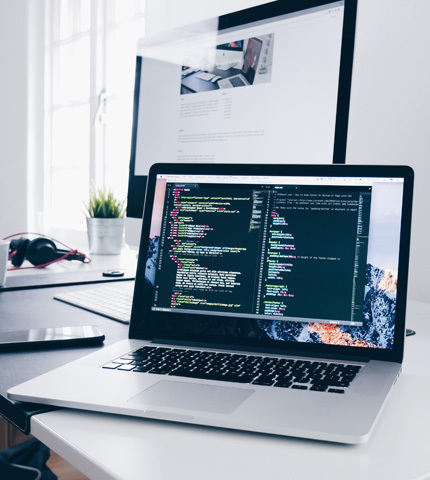 According to Payscale, web developers are paid well over $55k annually in the United States without including other perks and bonuses. In this article, I’m going to reveal 7 predictions about web development for 2019. Facts, not some random opinions will back these predictions. What Are Some of the Top Predictions about Web Development for 2019? There are plenty of changes that have taken place every single year, but we will never be able to keep track of them all. However, we can try to predict some of the top changes that could take place in the future. Here are some of the predictions about web development in 2019, which are backed by data and facts. In one survey, researchers found that around 60% of respondents interacted with chatbots at least once in the past 12 months. Today, customers want quick answers, and they also want quick answers. I believe you guys must have encountered dumb chatbots, a few years back. Surely, chatbots are more intelligent now. However, businesses will want even more intelligent chatbots in 2019. They want to be able to give a pleasant experience to their customers when they are dealing with chatbots. They want to make their customers feel like they are dealing with a real human being. Whenever someone wants to create a website for them, they will likely demand you to install intelligent chatbots (not a dumb one) to help them increase sales. Learning about Artificial intelligence will make you more attractive as a web developer. Most of you reading this article must have heard about static website generators. It is a tool that allows you to create a website with plaintexts via stored files. We can create a static website with a better load speed, traffic handling, and safety with these generators. However, these static website generators do not help you create a user-friendly website. With that said, these tools will boost your development speed. You can use these tools to create a static site and then add some additional features to offer a superb user experience. In 2019, you will see more developers using these frameworks. To use it effectively, you can try a Node.js training. The training will allow you to use Node.JS to the fullest, as it will give you all the necessary information that you need to use it. There has been a lot of talk about building responsive websites. However, the discussions will now shift from reactive to adaptive sites. With adaptive websites, brands can give a drastically improved user experience to their users, leading to a better conversion rate. The mobile experience significantly differs in comparison to the desktop experience. Nowadays, mobile usage is increasing at a steady rate. According to this study, an average American spends around 3 hours and 35 minutes on his/her smartphone every single day in 2018. This is an annual increase of over 11 minutes. The increment in mobile usage is sending a signal to businesses to focus more on mobile user experience. Google recently announced that it is rolling out the mobile first index. What this means is that Google will first check out users’ experience on smartphones before deciding the ranking for the website. In 2019, you should expect more and more businesses to ask you to improve their websites’ mobile experience. The web users are now getting attracted towards interactive yet straightforward graphics. The web developers should realize that to counter the diminishing attention span, they must come up with great captivating graphics on their web pages. The web users are getting bored with static images and flash. They now want to see a more evocative UI. You can expect the demand for motion UI to increase in 2019 sharply. It takes native mobile apps to offer the best possible user experience on smartphones. However, it is not possible for every single business (for example, small companies) to invest in native mobile apps. It takes a lot of money. Furthermore, there is also a considerable maintenance cost. 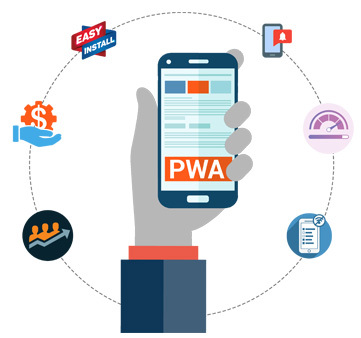 The progressive web app is an answer to offering the best user experience to allow the users to get almost native mobile app user experience. These websites automatically adjust themselves on smartphones, making users feel like they’re using native mobile apps. Here is a reason why businesses will want progressive web apps: it fits the budget of small businesses. Moreover, the enterprises shifting to progressive web apps have also seen an increment in their conversion rate. The technologies will keep changing, and we cannot stop it from progressing. The only thing we can do is keep an eye on the latest updates in our field of work. Keeping track of the most recent updates will help us make a sound decision on what to invest our time. Your next step is to note down the predictions in this article, learn new skills, and fulfill the demand of the market for earning well. I hope this article has offered some value to you guys. If I’ve missed out something in this article, let us know in the comment below.